[toc]Hives or urticarias are white or itchy red, raised clusters of welt formed over the skin due to an allergic reaction. They are formed due to histamine release in the body that cause the blood vessels to leak fluid deep into the skin layers. These can appear to be as big as saucers or as tiny as jujubes. There can be innumerable triggers that result into hives, anything from heat, pressure, medications, stress, cold, foods, pollen, and shellfish to viral infections. Everything in the world can act as trigger for hives for certain individuals and others may not be affected at all. Around 10 to 20% people suffer from hives at some point in their lives. The chronic events of hives last for longer than 6 weeks and the exact causes remains unknown. Fortunately, there are several natural ways to get rid of discomfort and itching experienced with hives. 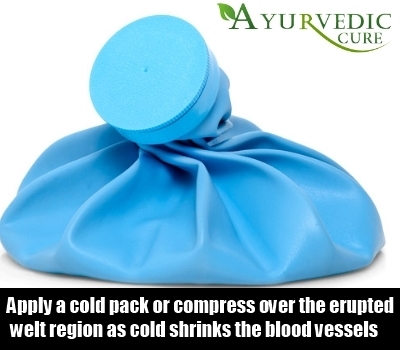 Apply a cold pack or compress over the erupted welt region as cold shrinks away the blood vessels, blocking more release of histamine. Alternatively, take a cool bath by soaking the affected region in cold water and get rid of the discomfort and itching. For those, whose hives are triggered by cold itself, this remedy should not be executed as it will act as a trigger, not a solution. For rest, cool compress serve as the best topical natural solution for hives. 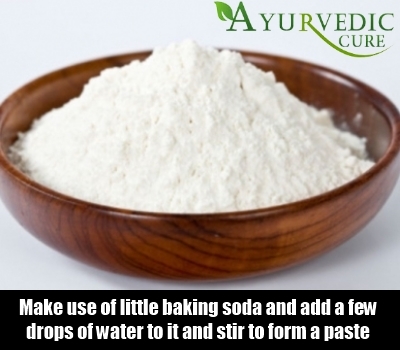 Make use of little baking soda and add a few drops of water to it and stir to form a paste. Use this paste as an effective natural cream to put an end to itching and irritation. Alternatively, tartar can also be used instead of baking soda to prepare the paste with water that can also be used in similar manner as a healing cream for hives. Add some amount of colloidal oatmeal or cornstarch in bathing water and then soak yourself for 10 to15 minutes. Soon, one will feel relieved from hives itching after the bath. Be careful, while coming out of the tub as fine ground oatmeal gets slippery and can result in slippage. Prepare a disinfectant solution using 2 teaspoons of lukewarm water in one teaspoon of vinegar and then dabbing this solution with help of cotton over the hives. Another alternative is to prepare the solution using 3 quarters vinegar with one quarter brown sugar and 1 tablespoon of fresh ginger and then boil them together. Then use this solution over hives for a number of times, in a day and get rid of discomfort from regular itching. Foremost step is to know the trigger causing hives. With careful tracking, a particular lifestyle factor can be identified that causes eruption of itchy and red welts. In case, it is a food trigger, eliminate the food in all forms from the diet and observe a reduction in outbreaks. In case, it is the result of a particular medication, refer to the doctor to replace it with a newer drug. Though, hives are very uncomfortable but still remain harmless and disappear within a matter of a few minutes or hours or days in majority of cases. Those, who have hives around the eyes or mouth or experience dizziness, wheezing, light headedness or breathing difficulties, should seek medical attention as one may suffer from anaphylaxis that can become life threatening, when internal swelling of tissues interfere with breathing passages.